Last year when HSLANJ gave Unbound Medicine the opportunity to showcase one of their latest products, uCentral™ was the obvious choice. 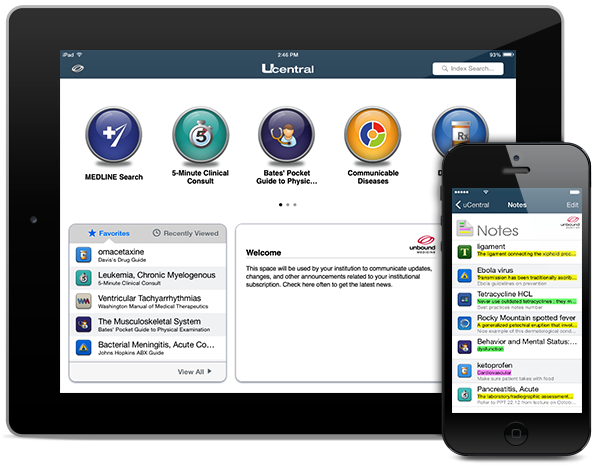 Libraries can use the powerful mobile solution to build a custom, integrated collection of trusted medical resources and distribute them to their patrons via smartphones, tablets, and the web. This year, uCentral remains an ideal solution for libraries, and the mobile and web app has continued to evolve. Based on feedback from librarians, patrons, and faculty members, a number of enhancements have been made to uCentral. The first and most well-received improvement has been the addition of Notes to all uCentral accounts. While the native mobile access to an institution’s custom collection of medical references has always been an essential part of the user experience, Unbound recognized the feedback asking for the ability to use their device to make personal notes within entries. The developers worked hard to create a tool that would facilitate this powerful new feature. However, the Notes feature that was created, and ultimately implemented, for uCentral went one step further. Not only are users able to add and edit any personal notes to any entry in the resources, but they are also able to make colorful highlights. With three highlight color options, patrons can choose to categorize any notes that they make. Additionally, the Notes feature syncs across all devices so if a person makes a note on their smartphone, that note and highlight will automatically sync to both their tablet device and the web. Another enhancement to uCentral has been the option to add Calculators. Having clinical, conversion, and dosing calculators integrated with the custom collection of resources has proven to be an extremely popular addition. Now, rather than having to find a way to make clinical calculations in another app or on another device, Unbound has provided a way for users to easily make calculations right inside the app, increasing efficiency and saving time. Calculators can also be integrated with select resources in uCentral. Davis’s Drug Guide, for example, gives users the ability to move directly from a drug monograph to dosing calculators and back again. This powerful tool is just one of many innovations seen in Unbound Medicine’s diverse offering of clinical decision support apps. As health care resources continue to evolve, Unbound Medicine works hard to stay ahead of the curve. uCentral empowers libraries to choose their resources and provides helpful tools that can be added to their collections. Working with each institution to implement the solution that works for them is a point of pride for Unbound. Librarians at each institution can rest assured that their voices will be heard and uCentral will be a resource that their patrons will continue to use on their mobile devices both in the classroom and at the point of care.